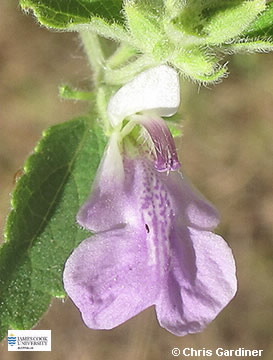 An erect herb to about 1 m tall sometimes taller; leaves simple, opposite, lanceolate with toothed margins, hairs present ,and on the under surface there are small pale circular glands. Flowers are 2-lipped in axillary clusters; corolla varies in colour from pink to blue to pale purple; 2 fertile stamens. Fruit splitting into individual mericarps.